This year as people are freezing and exposed to the bone-chilling temperatures on the East Coast, you'll be watching the Super Bowl from the comforts of the ultimate Super Bowl Party. Don't head to New Jersey for the Super Bowl. Instead change your plans and get to Las Vegas for a huge party on the Las Vegas strip. Casa di Amore throws a Super Bowl party in Las Vegas every year and it keeps getting bigger and bigger. Last year the party grew beyond 600 avid football fans and this year proves to be even larger. 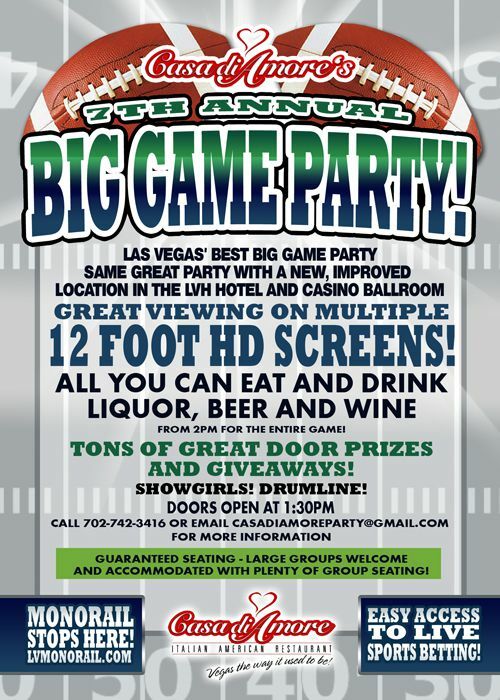 When is the Casa di Amore 9th annual Big Game Super Bowl party in Las Vegas? $150 per person, all food, drinks, entertainment and gratuity are included. Why is this the Super Bowl Party you should choose? The Monorail stops right out front of the hotel. That means you can stay anywhere on the strip and get a ride to the party. $150 per person all inclusive of sales tax, ticketing and includes a great branded bar, plus beers, wines, juices etc. Buffet going all day long as well with Philly Cheesesteaks, Texas spicy hot links, and much more. Guaranteed table seating and plenty of room for large groups. Showgirls - Vegas Vanguard Drumline - Incredible door prizes this year and tons of giveways. Tips For Travel Deals To Las Vegas? What Type Of Show Are You Looking For In Las Vegas? Where Are You Watching The Super Bowl in Las Vegas?